Soul, the agency representing fashion brand Coach, wanted to ensure that the launch of a new concession within Selfridges, their first in the UK, was seen by as many potential customers as possible. The event already had significant PR activity going on around it but how could we amplify this? How do you make an intimate event designed for around a hundred people into something accessible for hundreds of thousands of customers around the world within short timescales while not disrupting the main event and associated PR? We developed a forty five minute live webcast which was embedded within a tweet to give the audience a sense of being at the event. By embedding the live stream within a tweet we were able to make it highly shareable. 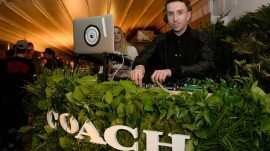 For the webcast we captured content with the famous guests on the red carpet such as interviews with Stuart Vevers (Creative Director of Coach) and Mark Ronson (who DJ’ed for the event, as did Nick Grimshaw). This content was edited and then combined with existing footage from Coach’s new range and three live tracks from Mark’s DJ set. This enabled us to deliver a highly engaging programme which both promoted the launch and gave Coach a reusable asset for further marketing. The average viewing time for the 45 minute programme was exceptionally high at 98.5% of the total webcast.